HP FlexFabric adapters and modules are converged network solutions that allow administrators to simplify and flatten the typical Ethernet topology. FlexFabric reduces the number of physical components, simplifies management, and improves quality of service (QoS). 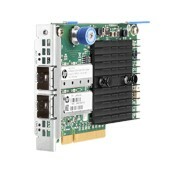 Combined with Flex-10 and Flex-20, Fibre Channel over Ethernet and accelerated iSCSI. HP FlexFabric adaptersprovide a lossless network environment for storage. Additionally, the FlexFabric adapters offload the storage protocols,improving CPU efficiency and storage performance.